Open daily, 8 AM - 5:30 PM. Call 604.276.0511 for reservations! Follow @mayfairlakesgolf on Instagram. These lessons are great for juniors of all ages who learn better in a smaller group or one on one. Our instructors will teach all aspects of the game in a fun environment. Fine Print: After committing to an initial 3 months of coaching, golfers may continue their coaching program on a monthly basis. Payment will be processed by credit card and will be charged on the 1st of each month. The fundamental movements and how to link them together in play. Building confidence and positive self-esteem. Working on general athleticism to help build strong bones and muscles, improving flexibility, developing good posture and balance, improving fitness, reducing stress and improve sleep. Our group lessons are a great way learn an introduction into the game. We will cover putting, chipping, 5 fundamentals of a set up and basic swing techniques. This program is perfect for a group of friends or family who want to pick their own times and dates. You can also design the curriculum to suit the goals of your group. 3-6 golfers. To book, contact Keri Moffat by email or telephone at 604.276.0585 x.113. Develop physical literacy by working on fundamental movement skills and building overall motor skills. Be introduced to golf specific skills. Work on general athleticism to help build strong bones and muscles, improve flexibility, develop good posture and balance, improve fitness, reduce stress and improve sleep. 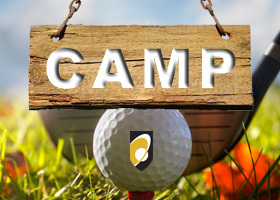 Half day golf camps suitable for Intermediate golfers, ages 6-15. Includes 12 hours of instruction at the practice facility. For 3 hours each day, campers sharpen their skills with a strong emphasis on the fundamentals—stance, grip, posture, full swing, rules & etiquette, etc. As the week unfolds, campers receive quality short-game instruction and by the end of the week, each Nike junior golfer will see improvement in his or her golf game! This 6-week program is the perfect progression from our Recreation Programs. The objective of this program is to continue reinforcing basic skills and building them into introductory competitive experiences. Suitable for juniors 6-9 years old, intermediate skill level. Includes 6, 45-minute lessons from a PGA Canada Professional/GBC Golf Academy Instructor.